We have saved so much money on batteries since my family started using Energizer® rechargeable batteries and charging systems. I am very excited to introduce you to the new Energizer® Recharge® Value Charger which is an excellent alternative to traditional batteries and an economical solution to your power needs. The Energizer® Recharge® Value Charger works with all Energizer® Recharge® batteries and can be adjusted to work with AA or AAA NiMH rechargeable batteries. I love that this charger is efficient yet portable so that I can pack it along in our bag when we go on vacation. It is user friendly as I simply put in the batteries that need charging, plug it into a power source and the dual red and green color LED shows the charging status. This is my favorite feature because it takes the guess work out of wondering if the batteries are charged and ready to use. It also indicates if there is a bad battery LED communication. As an eco-conscious family, I appreciate that this product is Energy Star® certified and has an auto shut off feature when the batteries are charged and the unit is not in use. 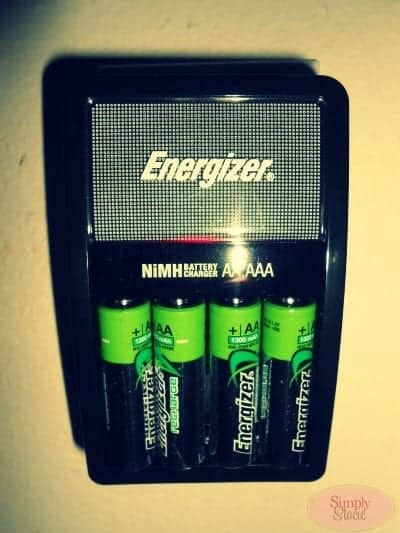 Not only am I saving money by using this rechargeable system from Energizer® but I am reducing my family’s carbon footprint too! We use the Energizer® Recharge® Value Charger and Energizer® Recharge® batteries for many different uses i.e. for powering video game players, portable CD players, radios, remote controlled toys and so much more. The batteries hold the charge for a long time and it avoids the frustration of running out of batteries. You are invited to visit the Energizer® website to learn more about the Energizer® Recharge® Value Charger and Energizer® Recharge® batteries. As a Mom who is on a budget, I appreciate that the Energizer® Recharge® Value Charger is attractively priced and available for purchase for the SRP of only $14.99 and the Energizer® Recharge® universal AA and AAA batteries are just $9.99/4 pack. Because it’s a great way to increase our sustainable living practices and hopefully encourage other “green” decisions for the whole family! We go through batteries very quickly! These are more environmentally friendly! Because we go through batteries like they are water. OH , would use it to save money on buying new batteries.